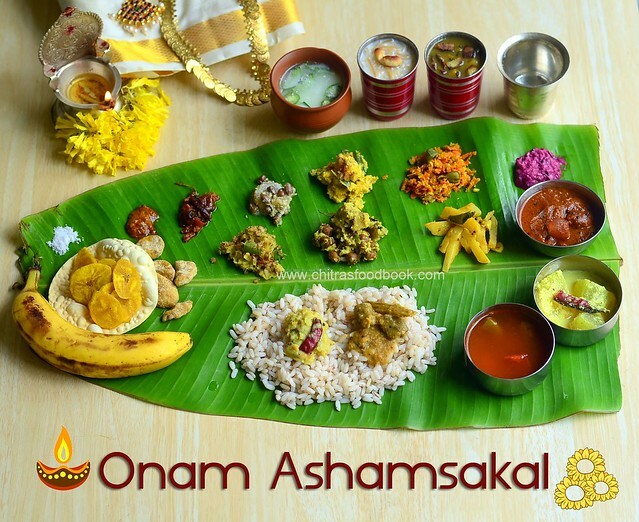 I am extremely happy and proud to share my 5th Onam sadya lunch menu with you all .Since 2012, I have been sharing varieties of Onasadhya feast during ThiruOnam festival. Every year I used to attempt some new, authentic Kerala dishes in my Onam sadya. I take this as a chance to learn many Kerala recipes and to express my passion for their food. 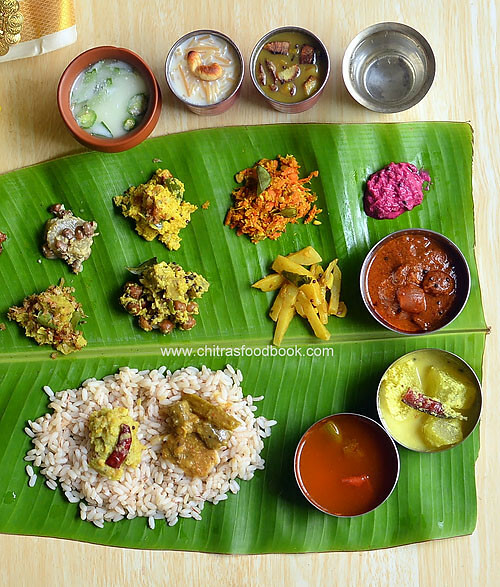 Moreover Sendhil and myself loves to have feast and treat ourselves with Kerala delicacies.Initially I started with a simple Onam sadhya menu in 2012. Later I started making around 15-20 dishes for the onam feast every year. Onam sadya preparation is the one and only thing that makes me busy in my kitchen and cook continuously for 3-4 hours . Pre Planning and organization is very important to cook a sadhya. So I have shared Onam sadya items list, how to prepare easily, Onam sadya serving order etc according to my knowledge and experience. Please excuse me and correct me if there is anything wrong . Most of the dishes are tried from our fellow food bloggers of Kerala. I have given the links for each recipes. 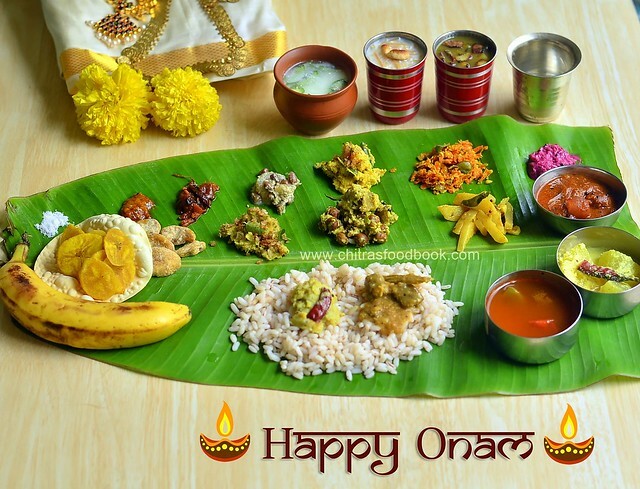 I hope this post would help you plan and prepare Kerala Onam sadya easily and quickly. Lets see how to prepare Onam sadya lunch menu in detail. 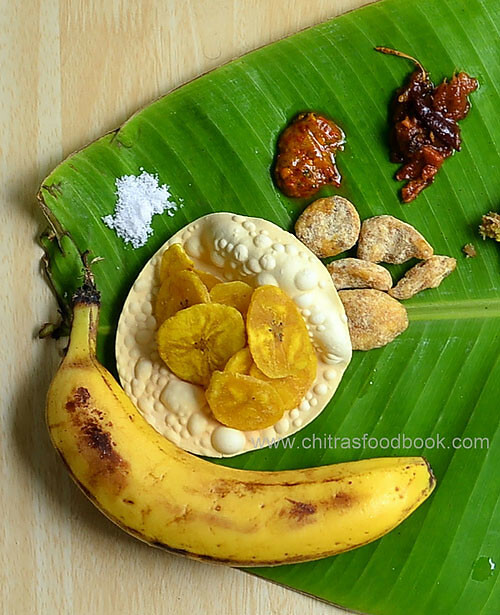 Onasadya Serving order : From tip of banana leaf : Salt, Papadam, Nendran banana, chips, upperi, Puli inji, Pickle, Olan, Kalan, Erissery, Puliserry, Avial, Kootu curry, Thoran, Mezhukkupuratti, Pachadi, Kichadi. 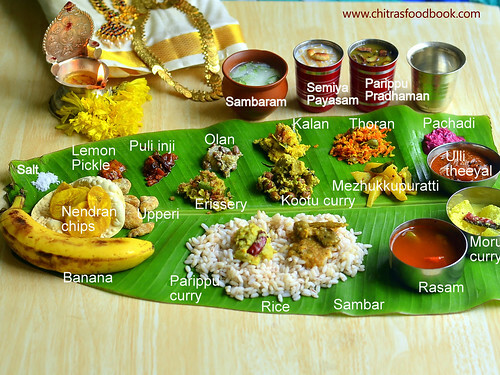 In the center of leaf : Rice, Parippu curry, ghee, Sambar, Moru curry, ulli theeyal, rasam, Sambaram, Parippu pradhaman, Payasam varieties on the top corner. Refer image below. Wish all my readers and friends a very happy Onam.”ONAM ASHAMSAKAL” !! Plan the menu, buy the vegetables and other items one day before Onam. Soak the tamarind for sambar, rasam and brown Chana( Kadala) overnight. In the morning, after taking bath, start cooking. Soak the Ada in water for 30 minutes if you are making ada pradhaman. I used 2-3 cookers of 3 liter capacity for making this menu. Last year when I made sadya,I noticed that most of my time was spent in pre preparatory works like grating coconut, extracting coconut milk, grinding masala, chopping vegetables and for cooking dals & vegetables.This year I wanted to make all these works simple and easy. So instead of grating 2 coconuts, I made small slices of it using a ladle edge with thick & blunt handle as u see in the picture.Make sure your mixie blades are in good condition else it may break.Then I dry ground all the coconut slices together and divided them into 2 parts.I used one part for taking coconut milk and the other part for masala.It saved lot of time for me. Take the required amount of coconut for each dish. Most of the dishes call for grinding coconut +green chilli+ jeera to a smooth paste. 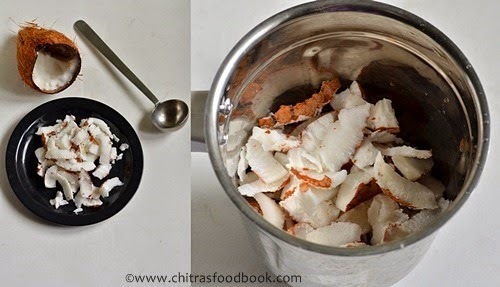 So grind it by taking a portion of coconut.Keep it and use wherever needed.Use the remaining coconut for taking coconut milk.Add in payasam. To this mashed dal ,Also I dry roasted the moong dal for parippu curry and pressure cooked it along with toor dal for sambar together in my big pressure cooker by placing moong dal in the bottom of cooker and toor dal for sambar in a tiffin box.Please refer the picture.U can even keep a plate of mixed vegetables required for sambar over the toor dal. When the dals are cooking, You can chop the vegetables for sambar, avial or kootu curry, olan, Pulisssery, pachadi, kichadi & inji curry.By this time,steam would be released from the cooker.Remove the toor dal box and mash the dal well.Similarly mash the moong dal too.Add little ground coconut paste and boil well. Parippu curry is ready. For cooking Vanpayar and vegetables for olan,kalan and erissery, i again used my big cooker and cooked them together by keeping one above the other in small bowls and plates.As all these veggies gets cooked in one go,u just have to add them in coconut mixture and boil it.For thoran, I cooked it in my small cooker adding very less water and cooked in high flame for two whistles. After removing this,cook the red rice adding 1:12 water and drain the excess water.Keep the rice aside. Make sambar, rasam and other dishes. Make the payasam at the end using the cookers ! It takes nearly 2-3 hours. I have planned to make few posts for the above mentioned recipes with stepwise pictures. Sorry I couldn’t do it now.Thanks for visiting this page. Hope u will try all these recipes and like it.Once again,I wish u all a very happy Onam. Enjoy the feast! Make a grand Onam spread on Festival day and enjoy with your family members.